The corpus luteum is a remarkable, transiently functioning organ that provides the endocrine conditions that are necessary and sufficient for the establishment and maintenance of early pregnancy. On a weight basis, it is the most productive steroid-secreting tissue in the body. It is abruptly formed from the remnants of the preovulatory follicle, and it undergoes continuous change thereafter. This chapter presents the corpus luteum in the context of its changing properties over time in the early, middle, and late luteal phase in cycles without conception and during early and late pregnancy. Themes for understanding the corpus luteum center on the sudden induction of an immense steroidogenic capacity, the importance of new vessel formation to this process, and the supervening effects of apoptosis in the event of conception failure. The corpus luteum is formed by the action of luteinizing hormone (LH) on the mature preovulatory follicle. Ensuing events, including steroidogenic outpouring, programmed senescence, and capacity for extension by gestation, depend on features characteristic of an adequately developed preovulatory follicle, including, most importantly, the number and LH receptivity of the granulosa cell population, both of which are follicle-stimulating hormone (FSH)–dependent properties. Acquisition of LH receptor (LHR) by preovulatory granulosa cells results from estrogen-stimulated and FSH-stimulated transcription of the LHR gene, the actions of which are mediated largely by intracellullar cyclic adenosine monophosphate (cAMP).1,2 Actions of LH and human chorionic gonadotropin (hCG) define the functional unfolding of luteal events and are thought to be exclusively dependent on activation of this single, G-protein–coupled receptor. LHR-mediated effects occur primarily via the Gs/adenylyl cyclase/cAMP/PKA signaling pathway, although evidence for activation of other signaling pathways (e.g., inositol phosphate pathway) and possible roles for these is accumulating.3 The luteotropic action of LH or hCG on follicles that are not mature can produce luteinization of the theca, where LHRs are present, but does not set in motion the distinctive sequence of changes in morphology and function of the granulosa and theca that characterize the corpus luteum. During the first several days after ovulation, there are important changes in histoanatomy, histology, and ultrastructure that describe the transformation of the mature follicle into the corpus luteum.4,13,14,15 At first, there is little to distinguish the histology of the corpus luteum from that of the late preovulatory follicle.4,14 The granulosa cells are not yet luteinized, or lipid-laden, and this layer remains avascular. Theca cells remain large and lipid-laden, and vessels of the theca are engorged. There may be a small amount of bleeding into the central cavity and, in early specimens, this feature may be the chief clue that ovulation has occurred. 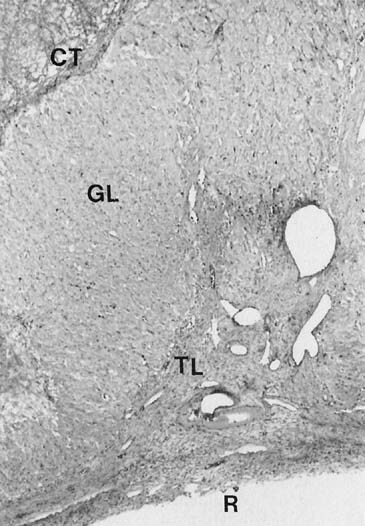 The pattern of progesterone secretion into the bloodstream by the early corpus luteum is dominated by a basal or tonic secretion, with little in the way of a pulsatile response to the episodic secretion of LH by the pituitary (Fig. 4).41 Progesterone secretion of the early corpus luteum is augmented little by hCG administration.42,43,44 This picture correlates with the functional predominance of the larger of the two functional and morphologic cell types identified in vitro in preparations of dispersed luteal cells. 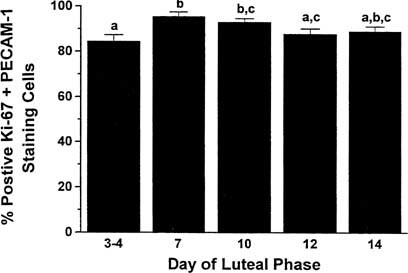 Inhibin has been identified as a secretory product of luteal cells in vitro.56,57 Levels of inhibin A begin to rise in the late follicular phase, peak in the mid luteal phase, and decline with luteal demise. Inhibin B exhibits high levels in the circulation in the late follicular phase and early luteal phase, and these decrease thereafter. Circulating levels of inhibin during the luteal phase are accounted for by the corpus luteum58 and roughly parallel progesterone levels.59 Granulosa luteal cells express mRNA for the inhibin alpha subunit to a greater extent than the mRNAs for beta A and beta B subunits, which is consistent with luteal production of inhibin A, inhibin B, and free inhibin alpha subunit.60,61 The LH-hCG dependence of luteal inhibin secretion has been confirmed in vitro56 and in vivo.49 The luteal phase depression of FSH levels may reflect in part the FSH-lowering effect of inhibin.62 This function would serve to avert the chaotic consequences of the superimposition of active folliculogenesis on luteal function.63 In addition to modulation of gonadotropin secretion, inhibin may exert paracrine influences on luteal function and development. By the mid luteal phase, the blood levels of progesterone, estradiol, and inhibin have reached their maxima, and 17-hydroxyprogesterone levels achieve a second peak.8 Now, at the full expression of its secretory capacity, the corpus luteum is poised at the junction of a course leading to regression and demise, in the nonpregnant cycle, or rescue and extended function, should pregnancy occur. 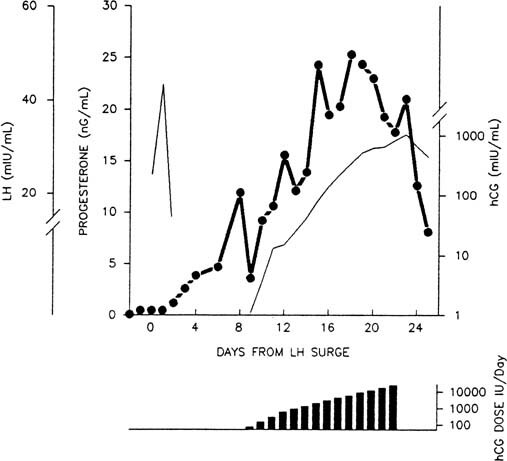 By the 10th to 11th postovulatory day, progesterone secretion declines despite continued LH support. Now, LH pulses occur at lower frequencies than previously, and functional luteolysis has started. Functional luteolysis can be defined as the progressive decline in the capacity of the corpus luteum to respond to LH and hCG. 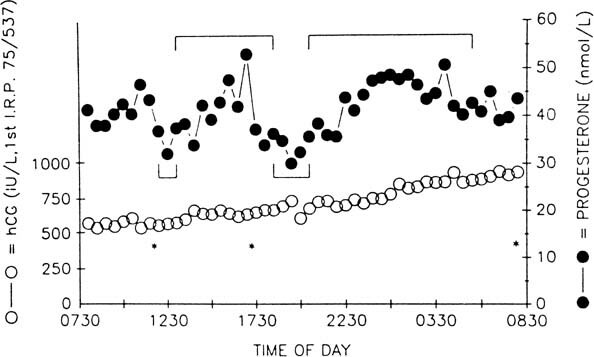 Without rescue by hCG, progesterone secretion now becomes negligible over the next 2 to 3 days. This process can be overcome only by the timely and rapid increase in trophic support generated by an hCG from a successfully established gestation. Luteolysis is an essential conclusion to the nonconception cycle: It permits re-establishment of conditions supporting renewed folliculogenesis and endometrial regeneration. Histologic evidence of regression includes shrinkage of cells in the granulosa layer. 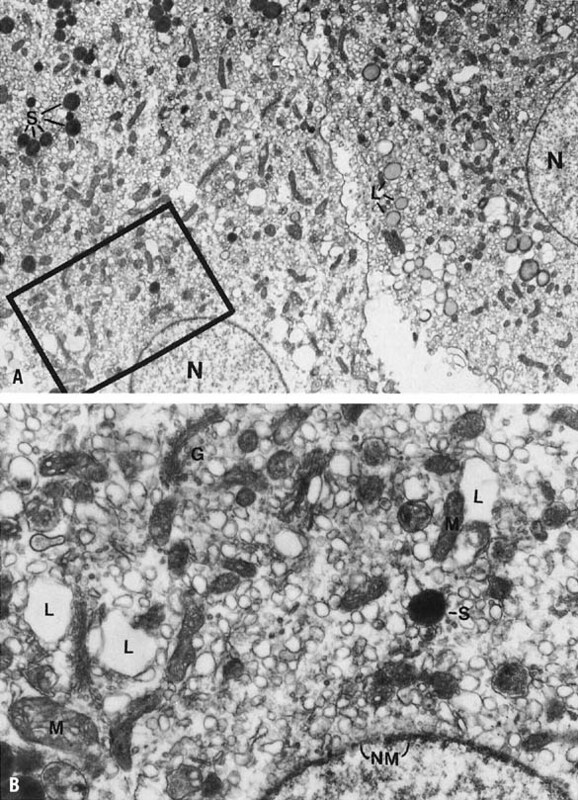 Theca and granulosa cells are progressively vacuolized, accounting in the former for the distinctive appearance of so-called mulberry cells.14 Histochemical studies show rapid loss of key steroidogenic enzymes.82 Ultrastructurally, there is breakdown of the organization of the endoplasmic reticulum, Golgi regression, and appearance of lipid droplet inclusions.13,69 The lutein zone exhibits progressive fibrosis, which presages ultimate hyalinization. Connective tissue organization of the central cavity continues, but even in the latest specimens fresh hemorrhage often is encountered. In early pregnancy, progesterone secretion and that of estradiol and 17-hydroxyprogesterone slightly exceed that of the nonpregnant mid luteal phase.143,144,145,146 The mechanism of the hCG-induced abrogation of luteolysis is incompletely understood but may include modulation of intraluteal prostaglandin synthesis.147,148 The enhancement of progesterone secretion by rising hCG is seen from near the time of implantation onward,145 but progesterone secretion seems to increase slowly, if at all, thereafter. 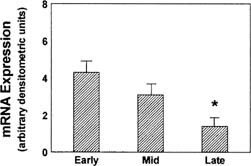 The gradual increase in levels of progesterone in early pregnancy is accounted for more readily by increasing progesterone secretion by the trophoblast.149 The corpus luteum can be estimated to account for approximately 76% of the circulating progesterone at 6 weeks, 50% by 10 to 11 weeks, and 33% by 14 to 15 weeks.150 The decreasing contribution of the corpus luteum to circulating progesterone also is reflected by the decline in blood levels of 17-hydroxyprogesterone, exclusively a luteal product, relative to the gradually rising progesterone levels of early pregnancy.144,151 The studies of Csapo and colleagues definitively delineated the indispensability of the corpus luteum to early pregnancy maintenance until about the seventh week152 and determined that this essential role could be accounted for entirely by progesterone.149,153,154 The evolution of gestational dependency on the corpus luteum to independence was called the luteoplacental shift and seems to correspond to the ability of the trophoblast to maintain progesterone levels at levels exceeding approximately 5 ng/mL. Fig. 8. 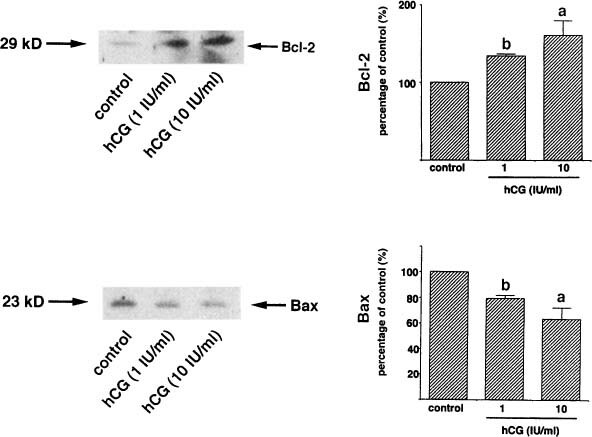 Serum progesterone, human chorionic gonadotropin (hCG), and luteinizing hormone levels and daily dose of hCG in a normal subject whose luteal phase was extended by administration of hCG in increasing daily intramuscular doses. The hCG levels mimic those seen in early pregnancy (note logarithmic scale for hCG levels and hCG doses). Progesterone levels fall abruptly after cessation of hCG administration despite elevated, but no longer increasing, levels of hCG. Relaxin, a polypeptide with homologies with insulin and nerve growth factor, is produced by the corpus luteum of early pregnancy. It circulates in small quantities in the final days of the nonpregnant cycle,163 but this increase is accelerated and continued in cycles of conception under the influence of hCG, independent of hCG stimulation of progesterone secretion.164,165,166 It can be evoked by the administration of hCG late in the luteal phase of a nonpregnant cycle,167 and levels in multiple pregnancy are related to the number of concepti.168 In early pregnancy, corpus luteum volume correlates more closely with hCG and relaxin levels than levels of progesterone, and relaxin levels correlate with levels of hCG.169 Relaxin increases expression of VEGF by endometrial cells in vitro and may play a role in endometrial neovascularization.170 In many species, relaxin induces remodeling of connective tissue of the birth canal and inhibits myometrial contractility.171 Known nonreproductive effects of relaxin, of unclear significance to the physiology of human pregnancy, include cardiovascular, breast, antiplatelet, and pituitrophic activities.172 Placenta and decidua are sites of synthesis of relaxin as well, which may explain higher levels of relaxin observed in pregnancies in diabetic women.173,174 Aluteal pregnancies achieved through assisted reproduction techniques are relaxin deficient, without apparent consequences to implantation, pregnancy maintenance, or mechanism of labor and delivery.166,175,176,177 Without an essential function in human pregnancy, the time-dependent and signal-dependent luteal secretion of relaxin points to ongoing differentiation of function within components of the corpus luteum long after it is formed. Sporadic and recurrent spontaneous abortions have been attributed to deficient function of the corpus luteum,77,179,180,181 but the role of this mechanism remains conjectural because the diagnosis of luteal-phase defect is imprecise and controversial,65,182 and it is made in nonconceptive cycles. Successful pregnancies in women with abetalipoproteinemia, in whom progesterone levels are low, would contradict the validity of defective luteal function as a cause of early pregnancy loss26; progesterone levels in subjects continuing pregnancy after luteectomy in the series of Csapo and coworkers149 and in women with normal pregnancies carefully studied at rest162 would suggest that levels of progesterone less than 10 ng/mL may not be abortifacient.179 Diagnosis and treatment of luteal defect as a cause of abortion should be made with caution pending verification of valid physiologic and diagnostic thresholds for progesterone levels in early pregnancy.181,183,184 Progesterone supplementation in the first trimester of pregnancy in women with a history of recurrent abortion or with threatened abortion may be reasonable, although not validated by study, when all three of the following are true: (1) normal ultrasonic landmarks for gestational age, (2) normal and normally rising levels of hCG, and (3) progesterone levels less than 10 ng/mL. The cystic corpus luteum of pregnancy may reach a size warranting surveillance for neoplasm but generally regresses by the end of the first trimester. Pain and hemorrhage from corpora lutea of early pregnancy may mimic ectopic pregnancy and occasionally require surgical management. If luteectomy is necessary, allowance for a margin of safety for the luteoplacental shift at 7 weeks would dictate progesterone supplementation for pregnancies of 12 weeks or less. After the increase seen over the first weeks of gestation, luteal secretion of progesterone144,146 and relaxin164 declines. Sampling of the ovarian vessels at cesarean section and the observation that progesterone levels rise in response to hCG administration postpartum confirm continued secretion of progesterone and relaxin by the corpus luteum at term and beyond.42,186,187,188,189 The contribution of the corpus luteum to overall progesterone secretion is small, relative to that of the placenta; this and the dispensability of the corpus luteum after the seventh week of gestation suggest that its continuance throughout pregnancy is a functional atavism. This is in contrast to the central role of the corpus luteum in the maintenance of pregnancy in species such as rodents, in which luteolysis itself is the initiator of parturition.